Sleeves are long I agree. But I would be the other side of the group here and say get the waist taken in a bit. From that shot, it doesn't show the contour of the waist, which I think makes the V of the jacket less apparent. Personally, I like my jackets "hug" a bit. It would also make your shoulders look broader. Today: Warm day in the City so went with an old JC (JCF?) jacket from a few years ago that doesn't get much use. Rather small lapels for my frame but has a fun roll to them for a very casual look. 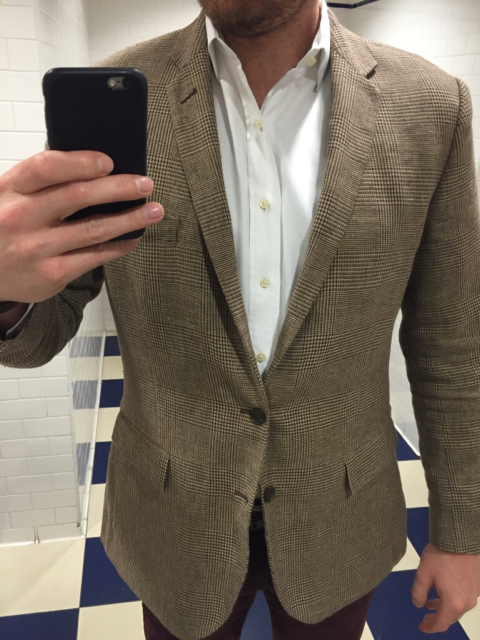 It's also a bit big on me, but looser for a linen jacket isn't the worst thing IMO. Another Ratio shirt and Bonobos washed chinos with real beat up bourbon AE McAllisters. 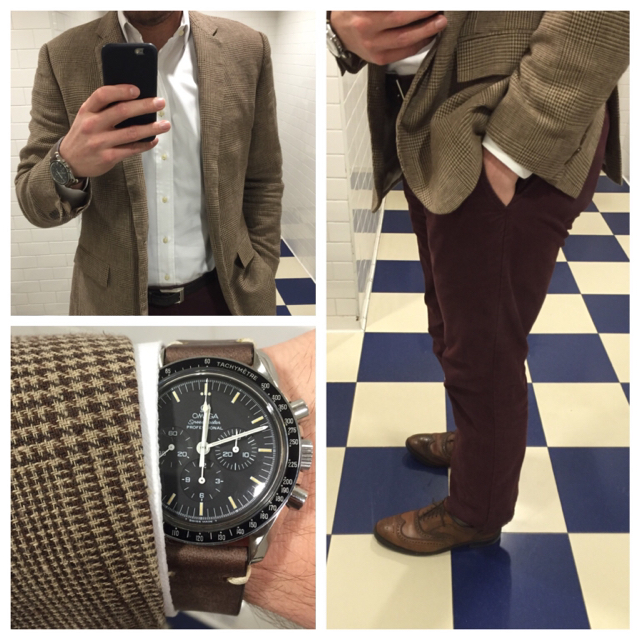 The pattern on that jacket is awesome & I think the colors look great paired with the burgundy chinos. Nice look. Last edited by JDI; March 10th, 2016 at 06:44 PM. I really like this look. I've got a couple lighter brown sportcoats that I'm never quite sure how to wear, but this kind of look is it. Are those dark brown chinos? @hornsup84 Haha. I totally wore that outfit a few days ago. I have the same jacket and the same shoes. I wore a white OCBD, too. Subbed in olive pants, but it was darn close. You make it look good. I've decided I need to step up my work attire game a bit--and start wearing the sportcoats I have more (new suits and another sportcoat en route by early April). Forgot pics from Monday but here are the last two days. Tues: broke out my AE walnut strands for the first time in ages, thought it worked well with the brown tones and gave it some contrast vs. the coat. 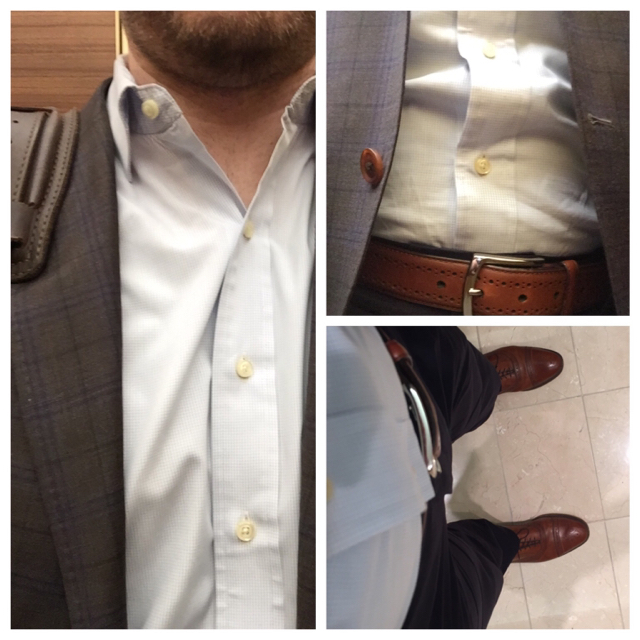 Sportcoat is Knot Standard, Ratio shirt and Bonobos cotton/linen blend pants. I think the mini check shirt still works with the larger patterned coat but open to criticism. Very nice, @dangerpenguin. Simple, understated, and classic. It all works. Just wondering. Did you go to SuitSupply's S/S16 Release Party last night in Dallas?